Item number Ed1.339 from the MOA: University of British Columbia. 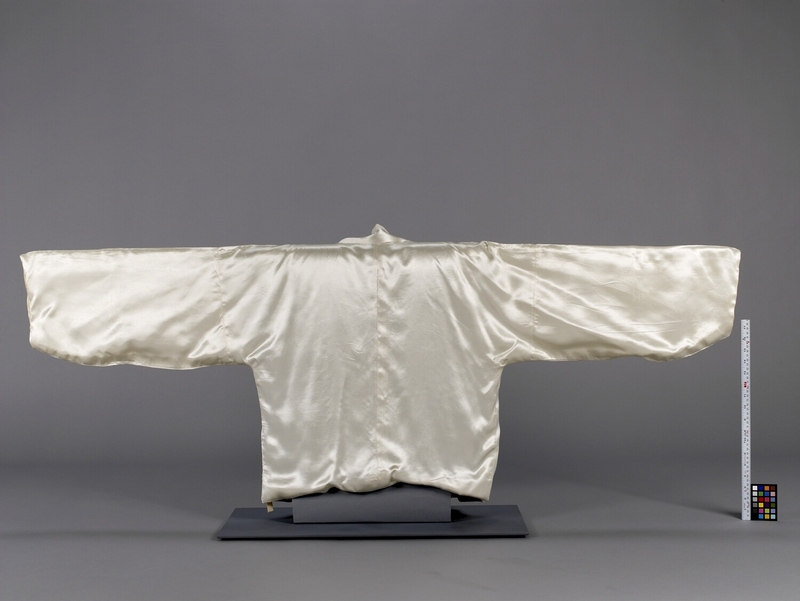 Man’s jacket of shiny white fabric. The jacket is waist-length and flares slightly from the top. The centre opening has inset panels on both sides that overlap when the garment is worn. The deep V neckline is edged on the outside and inside with facings. The facing has a rounded lower corner on the left side and a square corner on the right. The V neck is finished with a white narrow white cotton collar or facing. Centered on the end of the left facing is a long, wide ribbon tie made of the same fabric, with a corresponding tie sewn to the mid-point of the jacket on the right. Thin white inner ties are sewn to the inner right inner facing and the left underarm seam. There is a centre back seam. The long sleeves are set in with a straight seam and a convex curve on the lower edge, narrowing to the wrist. The inner lining is white fabric with a pattern of small squares. 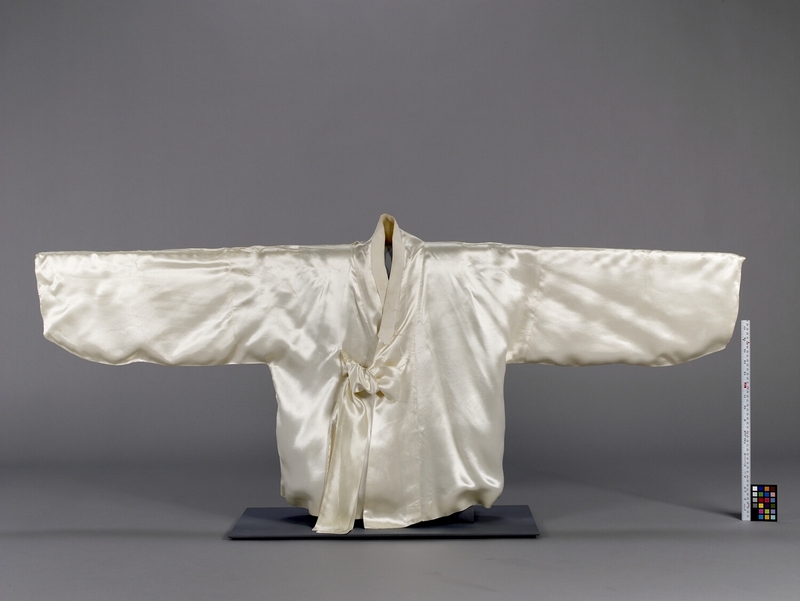 Men’s jackets “Jo-go-ri” had changed little from those of the Chosun Dynasty by the 1950s. Only the fabric was different, with rayon being substituted for silk. Such “Jo-go-ri” were part of sets of men’s formal wear. Lined “Jo-go-ri”, sometimes filled with felt or other materials, were worn in autumn and winter. The ribbon ties on men’s “Jo-go-ri” are shorter and wider than those used by women, as are the white collar and facings. The inner ties are traditional, and later were replaced with snaps. The garment is machine-sewn except for the white collar, which is attached with hand sewing.